Research papers on The Red Badge of Courage by Stephen Crane may focus on any of the themes or symbolism within the novel. You can have our writer explicate the thesis of the novel or choose a literary aspect you feel is interesting and how our writer custom write your research paper on it. Stephen Crane published his novel, The Red Badge of Courage, in 1895. The Red Badge of Courage is so accurate as a depiction of the life of soldiers during war that many people assumed that the author had participated in the Civil War in the United States. The Red Badge of Courage is purely based on his imagination although many of his other works are based on his own experiences. Stephen Crane never identifies the exact battle depicted in The Red Badge of Courage, but most knowledgeable critics agree that this battle actually took place long before Crane was born. The Red Badge of Courage focuses not on the ideological battles of the two opposing sides in the Civil War but on the experiences of a single soldier who experiences the horrors of war. Throughout the book “The Red Badge of Courage” the themes vary and are numerous just as the casualties of war that Henry experiences. The first theme that Henry must deal with, as Stephen Crane has written, is that of manhood. Henry, as a young boy, must leave his mother’s home and journey to battlefields. He faces the terror and fear of battle that he has never experienced before, and thus, he must grow into a man from a young boy during the novel. The second very obvious theme is courage. Because Henry is such a boy when he leaves to fight in the war, he carries with him a view of courage that is noble and has been passed on through playing with friends in imaginary “wars.” However, now Henry must assume courage that is new and unique to him, and as the novel’s title conveys, the courage is not always found in the ways that either Henry or the reader would traditionally expect. Throughout the novel fear plays a role, making it another theme. Certainly courage does not develop without fear, and Henry is afraid in many places during the novel. As he leaves his family, he puts on a brave face but experiences fear as he joins others to fight. During the battles he fears for his life, and at one point runs away, leaving his comrades to fight and to die, but saving himself. At this point he fears for his life again, as he is now a deserter. In the end, Henry must confront his fear to overcome its paralyzing forces, and march on courageous to the end. 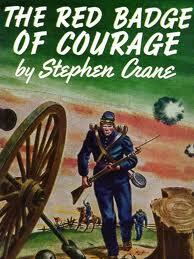 Stephen Crane did experience war as a correspondent during the Spanish/Cuban American War. The author believed in writing realistic novels so this experience did give him some actual participation although he never had any experience as a soldier in an actual battle in any war. “Though at time of publication mistaken for a Civil War veteran's first-hand account, that seminal modern war novel was wholly imaginary; Crane in fact sometimes recalled that what interviewing he did to construct his story was worthless”. The readers in the United States and in Europe were moved by the horrors of the war and the difficulties faced by the young soldier because of the brilliance of Crane’s descriptions. He describes the body of one man killed and shows not only the wounds but the emotions of the time. “His body lay stretched out in the position of a tired man resting, but upon his face there was an astonished and sorrowful look, as if he thought some friend had done him an ill turn”. His descriptions moved the readers because his words showed the horrors of the individual's experiences, especially the young Henry Fleming. Richard Grenier writing in the Washington Times compares The Red Badge of Courage to other works of historical fiction including Gone With the Wind and Cold Mountain. “Any serious person who studies works of what's called ‘historical fiction’ must realize - plot aside - that the reader is acquiring more of the attitudes of the period in which the book was written than of the period in which the book's story takes place”. The author also changed the way that other writers wrote about war, and his influence has been felt through the world wars, the Korean War and the Vietnam War. “He [Crane] moved away from the traditional romance or diary-like realism found in previous war literature and instead presented an imaginative psychological portrait of a soldier's reactions to the confusion, horror, and random death associated with combat”. The realism of Crane’s novel portrayed the emotions and horrors of war so that the readers had a much more accurate portrayal than ever before. Crane’s images continue to effect people who remember his words. A registered nurse, Janet Cogliano, writes about visiting a Civil War hospital and thinking about the words of Crane and his descriptions of the war. “Passages from Stephen Crane's "The Red Badge of Courage" and his vivid description of the pain, suffering and carnage of that war returned to memory”. According to John Carlos Rowe writing for Oxford University Press, Stephen Crane wrote to make an impact on the society and to point out weaknesses in the society. In particular, Crane wrote to point out that soldiers fought to free slaves and win rights for African Americans. Crane was born and wrote after this time, yet he saw the inequalities still suffered by African Americans. “The positive answer to that question is that Crane, like his contemporary Mark Twain, wanted to demonstrate how little had changed in America since the Civil War, especially in regard to the treatment of African Americans". The novel was a bestseller at the time, and the themes put forth by the author provided many points for contemplation by the readers. A Man Said to the Universe - A Man Said to the Universe is one of Stephan Crane's poems that relates man and the universe and how they fit into their cosmic roles. Blue Hotel - Blue Hotel research papers examine one of Stephan Crane's most disturbing short stories. A Bride Comes to Yellow Sky - A Bride Comes to Yellow Sky research papers examine the Old West as viewed by Stephen Crane in his works. Paper Masters writes custom research papers on The Red Badge of Courage and focus on the themes of Stephen Crane's novel and the main character Henry.